Published in: Sakai, Y. (1964). The species of Cladophora from Japan and its vicinity. Scientific Papers of the Institute of Algological Research, Faculty of Science, Hokkaido Imperial University 5(1): 1-104. Kamome-jima, Esashi, Hokkaido, Japan (Hoek & Chihara 2000: 140).Y. Sakai; 13 April 1948; SAP 029181 (Hoek & Chihara 2000: 140). Katayama, N. & Saitoh, M. (1989). 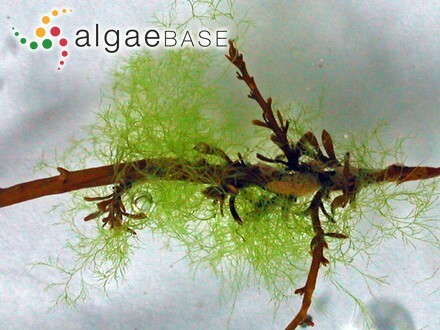 The influence of temperature shift on the photosynthesis of two marine macrobenthic algae, Cladophora densa and C. opaca. Korean Journal of Phycology 4(2): 143-147, 5 figs, 2 tables. Wang, X.Y. & Sakai, Y. (1986). Life history of Cladophora opaca and C. conchopheria (Chlorophyta). Japanese Journal of Phycology 34: 209-215.